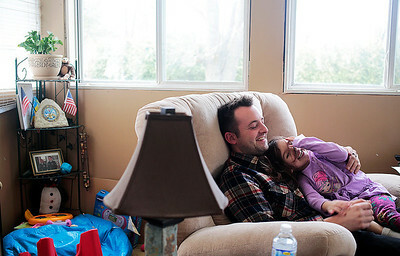 Kyle Grillot - kgrillot@shawmedia.com Andrew Bittenbender of Huntley sits with his daughter Cheyanne, 4, at his parents house in Marengo Saturday, April 19, 2014. After a roadside bomb in Baghdad in 2007 left him with a back injury, he decided to seek help in dealing with his injury. In November he joined the Northern Illinois Special Recreation Association's Healthy Minds Healthy Bodies program and participates in free training sessions at a nearby gym. The program offers 20 free personal training sessions for veterans with disabilities. "I can work, I can do labor, but there are days where it hurts to get out of bed," said Bittenbender, "I wanted to have someone there that could help teach me how to strengthen my back." 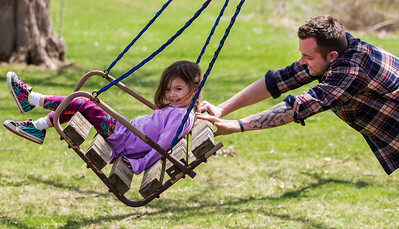 Kyle Grillot - kgrillot@shawmedia.com Andrew Bittenbender of Huntley plays with his daughter Cheyanne, 4, at his parents house in Marengo Saturday, April 19, 2014. After a roadside bomb in Baghdad in 2007 left him with a back injury, he decided to seek help in dealing with his injury. In November he joined the Northern Illinois Special Recreation Association's Healthy Minds Healthy Bodies program and participates in free training sessions at a nearby gym. The program offers 20 free personal training sessions for veterans with disabilities. "I can work, I can do labor, but there are days where it hurts to get out of bed," said Bittenbender, "I wanted to have someone there that could help teach me how to strengthen my back." 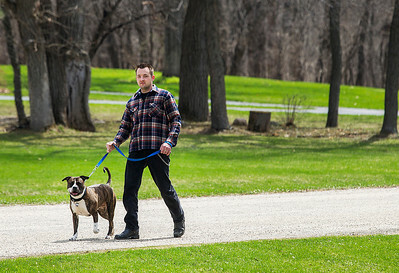 Kyle Grillot - kgrillot@shawmedia.com Andrew Bittenbender of Huntley walks his family dog Gucci along Oak Ridge Road in Marengo Saturday, April 19, 2014. After a roadside bomb in Baghdad in 2007 left him with a back injury, he decided to seek help in dealing with his injury. In November he joined the Northern Illinois Special Recreation Association's Healthy Minds Healthy Bodies program and participates in free training sessions at a nearby gym. 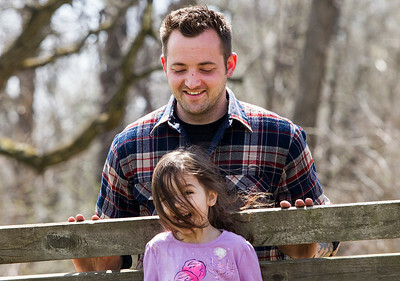 The program offers 20 free personal training sessions for veterans with disabilities. "I can work, I can do labor, but there are days where it hurts to get out of bed," said Bittenbender, "I wanted to have someone there that could help teach me how to strengthen my back." 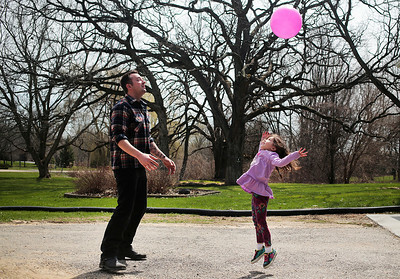 Andrew Bittenbender of Huntley plays with his daughter Cheyanne, 4, at his parents house in Marengo Saturday, April 19, 2014. After a roadside bomb in Baghdad in 2007 left him with a back injury, he decided to seek help in dealing with his injury. In November he joined the Northern Illinois Special Recreation Association's Healthy Minds Healthy Bodies program and participates in free training sessions at a nearby gym. The program offers 20 free personal training sessions for veterans with disabilities. "I can work, I can do labor, but there are days where it hurts to get out of bed," said Bittenbender, "I wanted to have someone there that could help teach me how to strengthen my back."